lifts and carries plates; strikes for and generally assists plater (222) q.v. ; cf. striker (190). does heavy, unskilled labouring work in boiler-maker's shop, e.g. hauling, holding, dragging, etc. 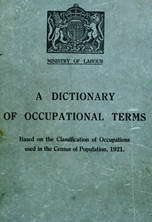 does unskilled manual labour in connection with fitting tubes into boilers and assists boiler tube fitter (222) q.v. generally. see labourer, boiler tube fitter's. a plater's helper q.v. who bends ship plates to desired shape, in hydraulic machine, under direction of plater; cf. plate bender (222). assists plater (222) q.v. in his work. a plater's helper q.v. who hoists finished plates to framework of ship and fixes them temporarily with 'bolts, ready for riveters; on N.E. Coast work usually done by plater (222). (ii) holds porter bar, used to control work in fire and on anvil, during welding. a plater's helper q.v. who passes plates through rolling machine, before bending or during other operations of preparing them for hanging up.